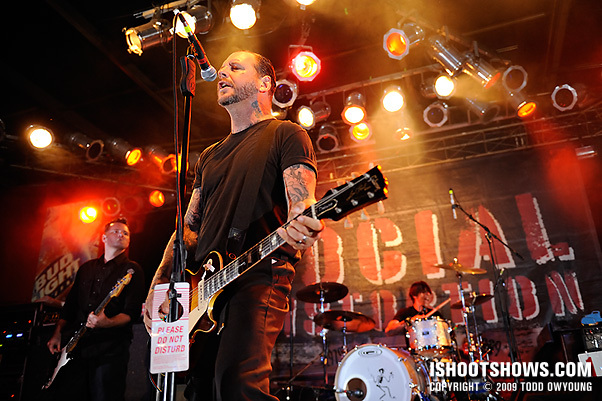 Social Distortion stormed into Pop's with a legion of fans singing along with Mike Ness to every word. 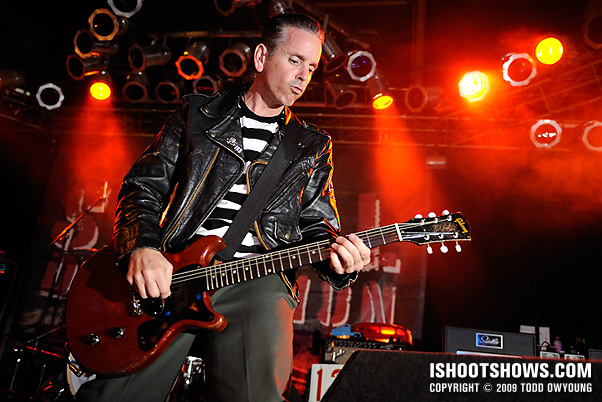 The ground rules for these punk icons were the first three with flash allowed. Naturally, I took this opportunity to throw down some wireless flash. First three songs and no restrictions on flash – I thought this concert was the perfect chance to play with a little wireless flash, something I haven't been able to do as much with the big summer shed shows. 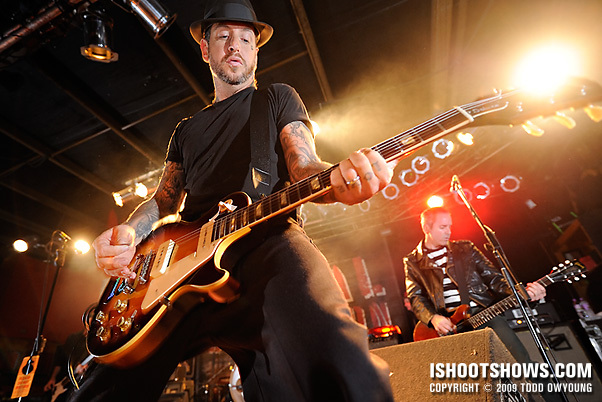 And with a band like Social D, whose Mike Ness came to the front of the stage often during the allotted three songs, I was in wide-angle heaven. Nikon 14-24mm f/2.8? Check. I shot this set around 1/125 at f/3.2 at ISO 1600, though I stopped down and dialed up my shutter speed as necessary when the background cans flared up. I used two remote flashes for this setup – two SB-900s controlled by a third SB-900 on the D3. 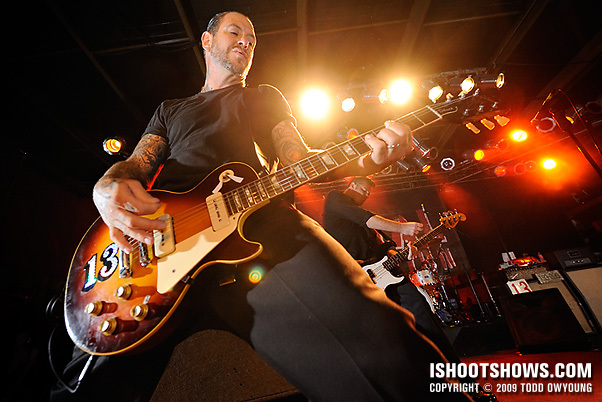 I shot the flashes on a combination of TTL and manual power during the three songs. The lighting for this set was great during the second and third songs, with strong white backlighting mixed with red that flared up during the most rockin' moments. For everything else, the stage was washed with dimmer, warm lighting. 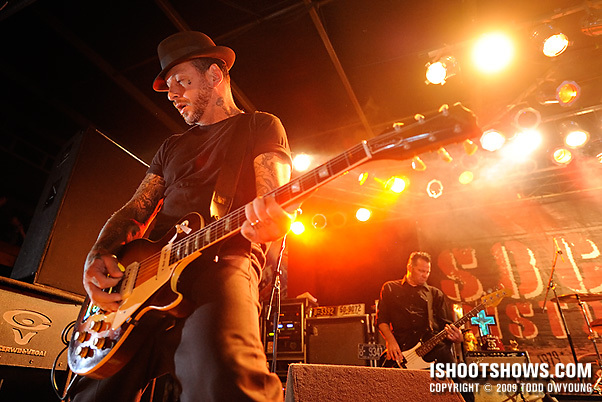 Overall, I was glad to have flash to pop out the performers, especially when they came to the front of the stage, as Mike Ness did at least once a song to rock out. One great thing for shooting this was the use of some haze at the back of the stage, which gave a nice boost to the hot backlighting this show employed. I had a blast with this concert. 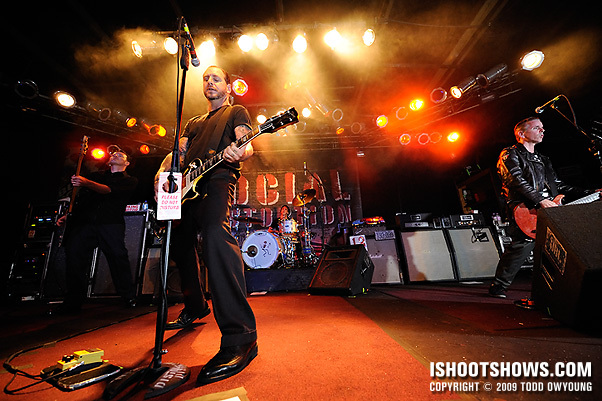 Though the three songs flew by, it was a pleasure photographing an icon band like Social D and having an opportunity to make images that I hope their fans will love. 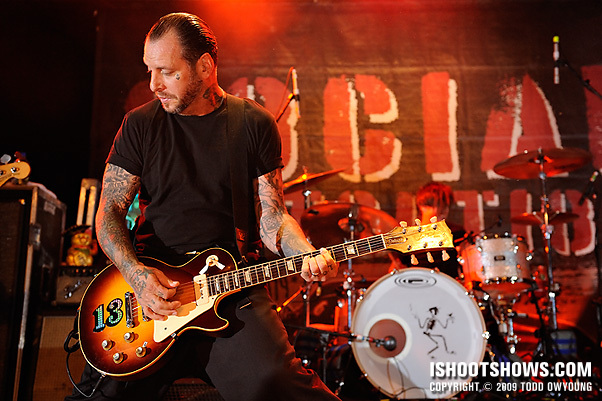 I remember watching a very young Mike Ness and Social Distortion on the punk documentary, Another State of Mind with Youth Brigade back in the 80’s. Check it out if you’ve never seen it. Todd, how often do you get to use flashes at shows? It’s got to be pretty rare, huh? Is it the artists or the venues that usually don’t allow flash? Do you ever wonder the history of flashes at shows? When did it become unpopular to use the flash? I haven’t seen that documentary, thanks for the suggestion. 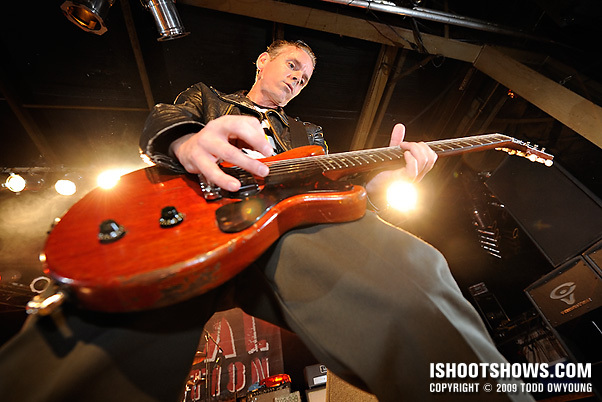 I don’t use flash very often at shows – mostly only at smaller venues like this. For larger shows, you’re right, it’s a rarity. Most of the time it’s the artists/management who do not allow flash, so I was happy to hear that flash was allowed for this gig. As for the history of flash, there was a discussion of this on the Flickr group – I’ll try to link it up if I come across it. Great images again Todd, just one question…were you hand holding the wireless flashes and if so, how on earth did you manage to hold them both and operate your camera?? Thanks for the comment. I wasn’t holding the flashes – they were positioned at either end of the short stage. I used two remotes, so I’d have needed at least another arm to use them handheld. great (just a little bit orange) set! If I had another arm, I could shoot with three cameras! Yeah, the house lights we very warm – I could have used a gel, but I do like having a bit of white light cutting in to the images and keeping the native color balance of the lights. Your are right, I’m a Social D fan and I love them. Hey Martin, thanks for the comment! Always great to hear from fans of the bands, nice to hear from you again. ive been trying something similar.did you position the flash on the floor on there stands,pointing which way,tilted up or down? i enjoy your words on the music scene keep it up. Thanks for the comment. I positioned the flashes at either end of the stage pointing in – with diffusers on. Cheers. Great as always Mr O.. Question tho: Your flashes were set up stage left and right – correct? You obviously came in early to set them up? Were there other photogs there with the same set up? If so, how did that work when it came to 1) wireless channel interference and 2) Light interference? Thanks alot! Awesome! 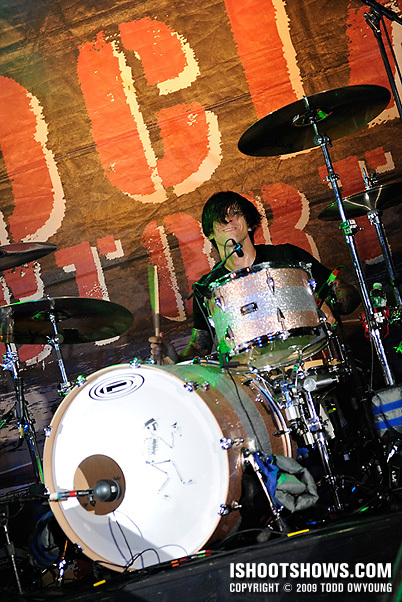 You definitely capture their music perfectly in your images. great Set again… got a ask another flash question though. 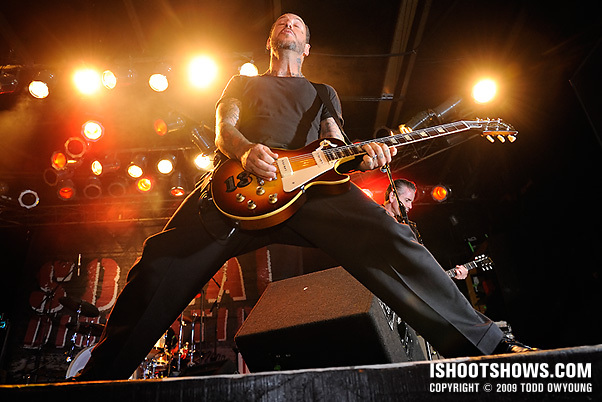 Do you bring lightstands with you and place them at the sides or are you just putting the flashed on the stage? Question basicly is how do you set them up? I’m thinking about using flash this way to a lot of the time, but with stages without a photopit (those are the places in my area were you need to use flash most of the time), I don’t want to bother the paying audience that much.